For over three decades, the San Diego amputation attorneys at the Law Offices of DiMarco | Araujo | Montevideo have dedicated their careers to helping victims of traumatic injuries. We want to be there for someone when they need it most: After an injury. Amputations are hard on the victim and their family and having experienced lawyers is important. We hope to have a free meeting with you to discuss your concerns, your questions, and your potential legal case regardless of whether the amputation is due to a traumatic injury event, disease, or deformity. Our San Diego work injury lawyers diligently represent all types of amputation injury cases from workers’ compensation claims and personal injury cases to work injury cases. Each and every lawyer and staff member at our firm pledges to walk with their clients throughout the entire legal process. Our San Diego California amputation attorneys at DiMarco | Araujo | Montevideo will work with a comprehensive team of professionals to help prepare and conduct your case. This may include accident reconstructionists, therapists, economists, physicians, and vocational experts to ensure that you and your family receive what you are rightfully due from the insurance companies or party at fault. Call us right now to setup your free initial consultation at (619) 946-6466. Amputations are the traumatic or medically purposeful removal of a foot, hand, leg, arm, toe, thumb or finger. Diseases account for the majority of amputations at 70% while trauma causes 22% of amputations. Congenital birth defects and tumors both cause 4% of all amputations. Amputations of the smaller extremities (toe amputations, finger amputations, and foot amputations) are actually more common than amputations of the larger and longer extremities (leg amputations and arm amputations). A general or orthopedic surgeon will usually perform the surgery. The reasons why someone would need a surgical amputation are numerous given just how many of these happen due to disease. The top reasons, though, include frostbite, gangrene, work injuries, melanoma, cancerous tumors, severe trauma, deformities like an extra finger or extra toe, osteomyelitis (deep bone infection), diabetes, and impaired circulation. Buerger’s disease and Raynaud’s disease are more reasons amputations should be considered. OSHA states that around half of all injuries that occur to people when they use the punch press require an amputation. Many other machines, vehicles and equipment that people use on the job have high rates of injuries that cause or require amputations including conveyor belts, power tools, and table saws. If you have been hurt (regardless of the how bad) while working, it is very important that you consult with experienced and ethical workers’ compensation attorneys with a track record for maximizing their clients’ compensation. Even injury events as traumatic as those that amputate or require amputation may qualify for more than just workers’ compensation (as work injury cases) as there is always the chance that a third party was also at fault. Amputations may happen or be required to be surgical done to any of the body’s extremities from the finger amputation to the leg or foot amputation. A list of possible amputations can be broken up into two main categories: lower body amputations and upper body amputations. The lower body amputations involve surgeries, disease, and trauma from the pelvis region down to the toes. The list of leg amputations includes: whole leg amputation, hindquarter amputation, rotationplasty, hip disarticulation, above knee amputation (transradial), knee-bearing amputation, and below-knee amputation (transtibial). The possible amputations for the foot include foot amputation, ankle disarticulation, partial foot amputation, or toe amputation. The upper body amputations involve trauma, disease and surgeries from the shoulder down to the hand and fingers. The list of the most common amputations involving the arm includes: arm amputation, shoulder disarticulation, elbow disarticulation, forequarter amputation, above-elbow amputation (transhumeral), and forearm amputation (transradial). The hand amputations include: hand amputation, metacarpal amputation, wrist disarticulation, and finger amputations including thumb amputation, middle finger amputation, ring finger amputation, pointer finger amputation, and pinky amputation. Though amputations continue to be safer and more successful, there still remains a fifteen percent rate of infection among amputation patients after the surgery. Patients are routinely given pain medication and antibiotics to help fight infection. Physical therapy will start very soon after the amputation. One of the fastest growing reasons to amputate is diabetes. A diabetes patient has a fifteen to forty times larger risk of needing a foot or leg amputation than a non-diabetic. This is because of the poor circulation in diabetic’s lower extremities. More specifically, the lowered circulation may cause gangrene or infection. The International Diabetes Foundation states that over 80,000 foot or leg amputations need to be done every year because of diabetes alone. Sadly, that number is rising. As a free service to anyone who is an injury victim, we provide initial consultations and case evaluations. We will be the law firm that gives you honest and straightforward answers so you can evaluate your position and plan accordingly. In addition, we work solely on a contingency basis. This means that you will not owe us anything until and unless we win your case. If we do not win: you do not have to pay us for our time and services that were provided. The amputation lawyers at DiMarco | Araujo | Montevideo will meet you at our office, your house or your hospital room on Monday through Friday between 8:30am and 5:30pm. By appointment, our amputation attorneys will even conduct the meeting with you on Saturdays, Sundays and in the evening. 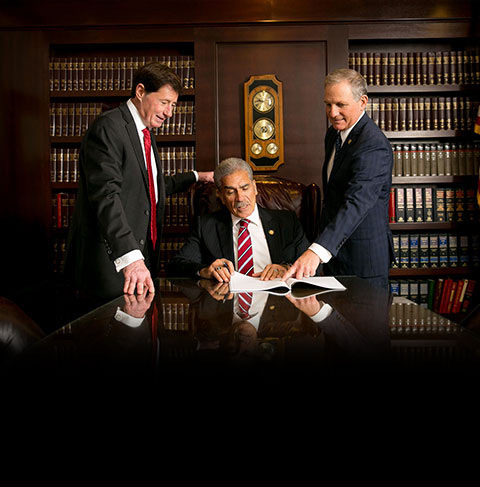 Our law firm has a solid reputation and we have built that since 1979 by working hard, being ethical and going the extra mile for all of clients. This is especially true for amputation injury clients since we know how hard that must be for you. We are well known and well regarded throughout San Diego, California, San Bernardino, Los Angeles, Ventura County, Riverside, Long Beach, Orange County, and Central California.